High Speed Packet data Access (HSPA) has been an upgrade to WCDMA networks (both FDD, and TDD) used to increase packet data performance. The introduction was done in steps; High Speed Down Link (DL) Packet data Access (HSDPA), was introduced in 3GPP Release 5, and Enhanced Up Link (UL), also referred to as High Speed UL Packet data Access (HSUPA), came in Release 6. The combination of HSDPA and Enhanced UL is referred to as HSPA. HSPA evolution (also known as HSPA+ and evolved HSPA) came in Release 7 with further improvements in later releases. Since UMTS was introduced in 3GPP Release 99 (R99) the need for improved support for Download data services has increased. Higher bitrates and lower delays were strong driving forces for the introduction of HSDPA in Release 5, at which point it was also decided that node changes should be kept to a minimum, and both R99 as well as HSDPA mobiles should be served in the same network. • Scheduling, select which UE(s) is/are to use the radio resources at each Transmission Time Interval (TTI), where one TTI is 2 ms. Decisions are based on Channel Quality Information (CQI) provided by the UE, UE category, as well as the type of services. Exactly one Transport Block (TB) is delivered in each TTI, see figure 1. In R99 the RNC is in charge of everything relating to handling of radio resources; scheduling as well as selection of transport format and setting of target for power control (outer loop power control) in order to provide the data rate required for the specific service for the connected UEs. The Transport format indicates the number of TBs as well as size of TBs per TTI, which in R99 is 10ms. Note that in R99 resources are allocated for the duration of the service – a connection is set up, even though channel switching is possible, while in HSDPA resources are allocated per TTI. HSDPA user data is carried on the new shared transport channel, High Speed-DL Shared Channel (HS-DSCH), which in turn is carried by one or more High Speed-Physical DL Shared Channel (HS-PDSCH), each using a channelization code with SF=16. The number of HS-PDSCH can range from 1 to a maximum of 15. 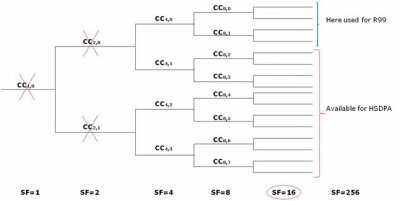 In R99 the physical channel carrying user data can be allocated a channelization code with SF ranging from 4 to 512. R99 and HSDPA will use channelization codes from the same code tree, see figure 2. Therefore all the DL channels within one cell are orthogonal at the point of transmission; at point of reception there will however be some interference, mainly due to multi-path fading. Figure 2. Channelization code tree, the code tree is shared between R99 and HSDPA services. All the codes with SF=16, except one, may be used for HSDPA if no R99 services are in use. In this picture the branch with CC4,0 is used for R99 and control signalling, hence in this example there are 12 available HS-PDSCH each with SF=16. A major feature in HSDPA is that the channelization codes can be shared not only through code multiplexing, as in R99, but also using time multiplexing. 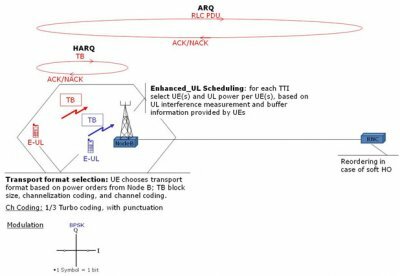 In time multiplexing one UE is allocated all the channelization codes available for HSDPA in one TTI and another UE may use all the resources in the next TTI. Through time multiplexing the radio resources may be more efficiently utilized than with code multiplexing since in each TTI the resources can be allocated to the UE experiencing the best radio channel. Of course if the data to be delivered does not require all available codes, then code multiplexing can be used. The maximum channel rate for HSDPA is 14.4 Mbps, with a peak user data rate of 13.4 Mbps (on MAC level), compared with a maximum user data rate of 384 kbps for R99. In R99 it is possible to use retransmission, ARQ, on the RLC protocol layer, between UE and RNC, but in HSDPA Hybrid ARQ (HARQ) is introduced enabling retransmission on the physical layer between UE and NodeB. ARQ relies on error detection only, while HARQ uses both forward error detection and correction. In HSDPA also soft combining is used, meaning that a received faulty TB will be stored in a receiving buffer and recombined with the retransmitted TB, in order to enhance likelihood of correct decoding. 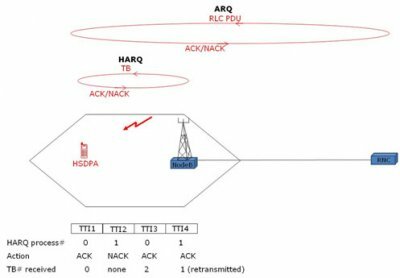 HARQ also works much faster than ARQ, since HARQ is used per TB and on the physical layer, and ARQ is used per RLC PDU, including data for possibly many TBs and more protocol layers are involved. HARQ is used for both non-real-time as well as real-time services. ARQ is still useful for non-real-time services when HARQ fails. In order to avoid stalling due to data processing times and possible retransmissions, up to 8 HARQ processes can work in parallel, see figure 3. Figure 3. ARQ, between UE and RN, and HARQ between UE and NodeB. The number of possible HARQ retransmissions can be configured. If the maximum number of HARQ retransmissions are done without successful decoding of the contents, then the ARQ procedure will take over. In order to avoid queuing a number of HARQ processes work in parallel, in this simplified picture there are two HARQ processes. In TTI #1 HARQ process #0 successfully receives TB #0, and sends an ACK, In TTI #2 HARQ process #1 fails in decoding TB #1, hence sends a NACK, thereby asking for a retransmission. While HARQ process #1 waits for the retransmission, HARQ process #0 successfully receives the next TB, #2, in TTI #3. Eventually, here in TTI #4 HARQ process #1 successfully receives TB #1. 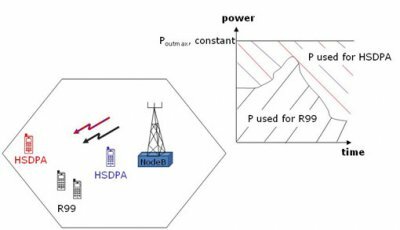 In HSDPA the resources shared between DL R99 transport channels and HSDPA transport channels are power and channelization codes. 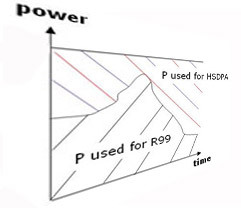 When HSDPA services are active, DL power from the NodeB – the sender - is normally kept constant and shared between R99 channels and the new HSDPA specific channels, power not used for R99 can be used for HSDPA, see figure 4. If there is no HSDPA traffic, then the power will fluctuate, depending on the R99 usage. A new MAC protocol, MAC-hs, is introduced in NodeB to handle scheduling and link adaptation, see figure 5. Figure 5. New MAC-hs protocol sublayer. Soft handover is not used for the HS-PDSCH, but is still used for both DL and UL R99 channels. In order to fulfil the need for improvement also for UL packet data, Enhanced UL – also called HSUPA – was introduced in 3GPP Release 6. A major difference between DL and UL is that for DL there is ONE transmitter per cell, NodeB, whilst for the UL there might be MANY transmitters, each UE with an active UL, each moving and sending independently. Hence, the DL physical channels will all be orthogonal- at least at the point of transmission, having channelization codes from the same code tree, and they will be sharing the available power in the NodeB. In the UL it is not possible to get perfect orthogonality since the senders, UEs, are moving independently. Every UE has its own channelization code tree and its own battery. As in R99 long scrambling codes, with low correlation, are used to separate between channels from different transmitters, i.e. NodeBs DL and UEs UL. In HSDPA the data to different UEs is carried on a shared channel, while in Enhanced UL the data from different users will be carried on a dedicated channel; transport channel Enhanced Dedicated Channel (E-DCH) mapped onto the physical channel E-DCH-Dedicated Physical Data Channel (E-DPDCH) – for high data rates more than one E-DPDCH will be used. The E-DPDCH can use a channelization code with a minimum value of SF = 2. In Release 6 the maximum channel rate for Enhanced UL is 5.8 Mbps, with a peak data rate of 5.4 Mbps, this value is valid for the MAC layer. For Enhanced UL there are two options for TTI, 2 ms or 10 ms.
For Enhanced UL scheduling is still carried out by the NodeB, now the receiving node, while transport format selection is done by the scheduled UEs, see figure 6. The NodeB will measure the interference level on the UL and receive information about buffer status in the UEs, and make a decision about which UEs that are to be scheduled. Information about scheduling decision is delivered in scheduling grants, which also provides information about how much power the UE(s) may use when transmitting. The higher the power the higher the bitrate, and the interference! In the DL the shared resources are channelization codes and power, in the UL the shared resource is contribution to the intra-cell interference. For Enhanced UL channels soft handover will be used in basically the same way as for R99. To handle these functions new MAC protocol sublayers are added, MAC-e in NodeB is responsible for scheduling and HARQ, and MAC-es in RNC to handle reordering of received data from multiple NodeBs in case of soft handover, see figure 7. To further increase bitrates in the evolution of HSPA, referred to as HSPA+, new functions are added; for example higher order modulation 64QAM (DL) and 16QAM (UL) as well as Multiple Input Multiple Output (MIMO), used only in the DL. Maximum channel rate DL, using 64QAM and 15 codes, is 21 Mbps and UL using 16QAM is 11 Mbps. MIMO, e.g. Spatial Multiplexing, is used to increase the overall bitrate through transmission of two (or more) different data streams on two (or more) different antennas - using the same channelization codes at the same time, separated through use of different data precoding and different pilot channels transmitted from each Tx-antenna - to be received by two or more Rx-antennas, see figure 8. In 3GPP Release 7 for HSPA there will be 2 Tx and Rx-antennas (2x2 MIMO). Figure 8. Simplified illustration of 2x2 MIMO (Spatial Multiplexing). Two TBs are precoded onto two data streams, then transmitted on two TX antennas and received by two RX antennas. In 3GPP Release 7 MIMO can not be used in combination with 64 QAM, but it will be possible in Release 8. New maximum channel data rates when MIMO is used are 28 Mbps in combination with 16QAM (R7) and 42 Mbps when used with 64QAM (R8). 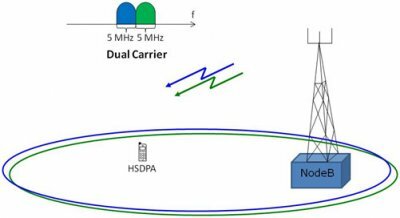 Other functions have been added to HSPA+ in later releases for example in Release 8 Dual Cell-HSDPA (also referred to as Dual Carrier-HSDPA, DC-HSDPA), where carrier aggregation of two adjacent 5 MHz bands, covering the same area, is used to increase the performance see figure 9. In releases after Release 8 dual carrier will also be introduced for Enhanced UL and also the number of aggregated carriers will be increased leading to Multi Carrier-HSPA.